Objective: Increased circulating leptin, a marker of leptin resistance, is common in patients with obesity and is also an independent factor in prediction of cardiovascular disease. The aim of this study was to evaluate the relationship between fasting serum leptin levels and the aortic augmentation index (AIx) in kidney transplant recipients. Materials and Methods: Fasting blood samples were obtained from 70 kidney transplant recipients. The aortic AIx was measured using a validated tonometry system (SphygmoCor). Plasma leptin levels were measured using a commercial enzyme-linked immunosorbent assay kit. Results: Simple linear analysis of the aortic AIx in kidney transplant recipients showed that body fat mass (P = 0.002), diastolic blood pressure (DBP) (P = 0.020), logarithmically transformed triglycerides (P = 0.035), and leptin (P < 0.001) were positively correlated, while height (P = 0.004) and the glomerular filtration rate (P = 0.022) were negatively correlated with the aortic AIx in kidney transplant recipients. Forward stepwise linear regression analysis of the factors significantly associated with the aortic AIx showed that leptin (P < 0.001), DBP (P = 0.014), and body height (P = 0.036) were independent predictors of the aortic AIx in kidney transplant recipients. Conclusion: These results suggest that the serum fasting leptin level is associated with the aortic AIx in kidney transplant recipients. Yen-Cheng Chena and Ming-Che Lee contributed equally to this work. Arterial stiffness is one of the multiple characteristics of cardiovascular disease (CVD), and the mechanisms of arterial stiffness are mostly involved with abnormality of regulation among elastin, fibers and collagen, reorganization of cellular elements, and a low-grade persistent inflammatory process ,,. The relationship between CVD and adipokines such as leptin, adiponectin, and resistin has been reported in recent years,. Leptin, a 16-kDa product of the obese gene and discovered in 1994, is mainly produced by white adipose tissue and involved in a wide range of functions beyond fat storage. The physiologic effects of leptin include reduced appetite and increased energy expenditure and the serum leptin level is positively correlated with body adiposity. Leptin also has been involved with stimulation of the renin–angiotensin–aldosterone system, the proliferation of vascular smooth muscle cells, endothelial oxidative stress, and the formation of reactive oxygen species, which contribute to the development of aortic mechanical dysfunction and arterial stiffness,. The European Society of Cardiology Working Group has described the importance of peripheral noninvasive vascular biomarkers for the primary and secondary CVD prevention. The aortic augmentation index (AIx), one noninvasive method to assess central hemodynamics/wave reflections, has been widely used as a clinical index of arterial stiffness,. The AIx is defined as the difference between the second and first peaks corresponding to the systolic blood pressure (SBP) and expressed as a percentage of the pulse pressure. Therefore, the AIx is an indirect measurement of central arterial stiffness throughout the direct measurement of central wave reflection. In end-stage renal disease patients, reduction of the cardiovascular risk and improvement of cardiovascular-related survival have been reported after successful kidney transplantation. Serum leptin, one of the adipokines, is a potential biomarker for monitoring the severity of CVD. The aim of this study was to determine the relationship between serum leptin levels and arterial stiffness, as measured by the aortic AIx, among kidney transplant recipients. Between May and August of 2013, we recruited kidney transplant recipients who were treated in a medical center in Hualien, Taiwan. Patients with any acute infection, malignancy, acute rejection, acute myocardial infarction, or pulmonary edema at the time of blood sampling or an arterial-venous shunt (fistula or graft) in the limbs were excluded from this study. Patients using medications related to calcium, active vitamin D metabolites, bisphosphonates, teriparatide, or estrogen, as well as those who refused to provide informed consent, were also excluded from this study. Finally, seventy patients were enrolled in the study for data collection and analysis. The study was conducted in accordance with the Declaration of Helsinki and was approved by the Human Subjects Institutional Review Board of Tzu Chi University and Buddhist Tzu Chi General Hospital (IRB100-91). Informed written consent was obtained from all patients before their enrollment in this study. Trained staff measured blood pressure in the morning for all patients, using standard mercury sphygmomanometers with appropriate cuff sizes, after the patients had been sitting for at least 10 min. SBP and diastolic BP (DBP) were taken at the points of appearance and disappearance, respectively, of the Korotkoff sounds. Pulse pressure was calculated by subtracting DBP from SBP. Hypertension was defined as SBP ≥140 mmHg and/or DBP ≥90 mmHg or prescription of antihypertensive medication in the past 2 weeks. A person was regarded as diabetic if the fasting plasma glucose was either 126 mg/dL or more or if he/she was using diabetes medication (oral or insulin). The participants' body weights were measured in light clothing and without shoes to the nearest 0.5 kg, and body height was measured to the nearest 0.5 cm. The body mass index (BMI) was calculated as the weight in kilograms divided by the height in meters squared ,,,,. Bioimpedance measurements of fat mass were performed at the bedside according to the standard tetrapolar whole-body (hand–foot) technique using a single-frequency (50-kHz) analyzer (Biodynamic-450, Biodynamics Corporation, Seattle, WA, USA). All measurements were carried out by the same operator. Fasting blood samples approximately 5 mL were taken. About 0.5 mL was used for hemoglobin levels and white blood cell counts (Sysmex K-1000, Sysmex American, Mundelein, IL, USA) and the rest was immediately centrifuged at 3000 g for 10 min. Serum levels of blood urea nitrogen (BUN), creatinine (Cre), fasting glucose, total cholesterol, triglycerides (TG), high-density lipoprotein cholesterol, low-density lipoprotein cholesterol, total calcium, and phosphorus were measured using an autoanalyzer (COBAS Integra 800, Roche Diagnostics, Basel, Switzerland) ,,,,. Concentrations of serum intact parathyroid hormone (iPTH) (Diagnostic Systems Laboratories, Webster, Texas, USA) and serum leptin (SPI-BIO, Montigny le Bretonneux, France) were determined using a commercially available enzyme immunoassay kit and enzyme-linked immunosorbent assay kit, respectively ,,,. The estimated glomerular filtration rate (GFR) calculation in this study was obtained by application of the equation from the Modification of Diet in Renal Disease. Patients were positioned supine and allowed to rest for at least 10 min before the test. Consumption of food, drink, alcohol, or tobacco was not restricted before the test, but the patients were not allowed to sleep or talk during the test. Pulse wave analysis by applanation tonometry was performed on the right radial artery and analyzed by SphygmoCor software (SphygmoCor system, AtCor Medical, Sydney, New South Wales, Australia) ,,. SphygmoCor software was applied for the pulse wave analyses by calculation of a number of major indices including the aortic AIx. Data with a normal distribution were tested using the Kolmogorov–Smirnov test and were presented as means ± standard deviation. Data were expressed as medians and interquartile ranges for nonnormal distributed patterns. The serum glucose, BUN, Cre, TG, and iPTH datasets showed skewed nonnormal distributions and therefore were recalculated by transformation to the base 10 logarithm; after transformation, the log-glucose, log-BUN, log-Cre, log-TG, and log-iPTH were then normally distributed. Simple linear regression analysis was first applied to the clinical variables that correlated with the aortic AIx values in kidney transplant recipients. The variables that were significantly associated with the aortic AIx were then evaluated for independence by forward stepwise regression analysis. All data were analyzed using SPSS for Windows (version 19.0; SPSS Inc., Chicago, IL, USA). The P < 0.05 was expressed as statistically significant. The anthropometric and biochemical data of all participants are shown in [Table 1]. The mean age of the 70 kidney transplant patients was 52.1 years, 38 (54.3%) were male, the mean posttransplantation duration was 70.8 months, the mean BMI was 23.8 kg/m 2 and the mean body fat mass was 29.1%. The average of SBP, DBP, and pulse pressure was 139.5 mmHg, 86.8 mmHg, and 52.7 mmHg, respectively. The mean aortic AIx was 18.4% and the mean serum leptin level was 42.6 ng/mL. The prevalence of diabetes and hypertension were 60% (n = 42) and 25.7% (n = 18). Current immunosuppressive agent use was analyzed including tacrolimus (n = 41; 58.6%), mycophenolate mofetil or mycophenolic acid (n = 52; 74.3%), steroids (n = 57; 81.4%), rapamycin (n = 12; 17.1%), and cyclosporine (n = 17; 24.3%). 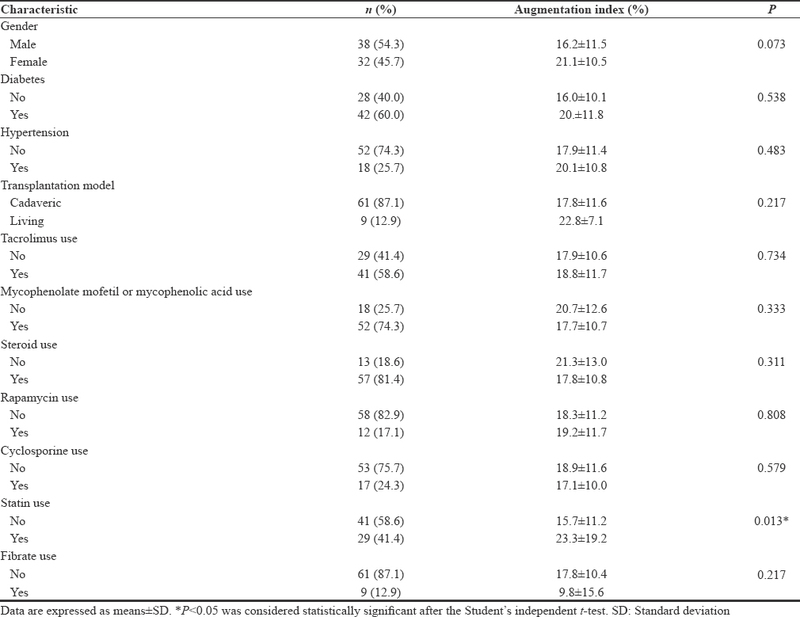 No significant differences were observed in the aortic AIx based on gender, donor type of transplantation, or medication use except for statins [Table 2]. The 29 patients (41.4%) who used statins had a significantly higher mean aortic AIx (23.3% vs. 15.7%, P = 0.013) than those who did not. Simple linear regression analysis of the aortic AIx values for the 70 kidney transplant recipients is shown in [Table 3]. The body fat mass (r = 0.356, P = 0.002), DBP (r = 0.278, P = 0.020), logarithmically transformed TG (log-TG, r = 0.253, P = 0.035), and serum leptin level (r = 0.425, P < 0.001) were positively correlated with aortic AIx. Body height (r = −0.339, P = 0.004) and GFR (r = −0.273, P = 0.022) were negatively correlated with the aortic AIx in the participants. The variables that were significantly associated with the aortic AIx values (body fat mass, DBP, log-TG, leptin, body height, and GFR) were analyzed by forward stepwise linear regression. Serum leptin (β =0.364, R2 = 0.169, P < 0.001), DBP (β =0.248, R2 = 0.230, P = 0.014), and body height (β = −0.228, R2 = 0.269, P = 0.036) were independent factors that were associated with the aortic AIx in our kidney transplant recipients [Table 4]. The current results reveal that body fat mass, DBP, TG, and the leptin level were positively correlated, while height and GFR were negatively correlated with aortic AIx in kidney transplant recipients using simple linear analysis. After adjusting these significant variables using forward stepwise linear regression analysis, it was found that leptin, DBP, and height were independent predictors of aortic AIx values among kidney transplant recipients. A high serum leptin level was associated with the aortic AIx in renal transplant recipients. Leptin is mainly produced by white adipose tissue, and its receptors are distributed in the mediobasal hypothalamus, and in the arcuate, ventromedial and dorsomedial nuclei. There are also abundant leptin receptors on the vasculature of the aorta. In the vasculature, leptin promotes vascular smooth muscle cell proliferation and induces endothelial oxidative stress and reactive oxygen species formation causing reduction of nitric oxide and aortic mechanical function, thereby contributing to arterial stiffness ,,,. The relationship between leptin levels and arterial stiffness has been widely studied in different populations. In kidney transplant recipients, an increasing serum leptin level is a predictor of the development of central and peripheral arterial stiffness with measurement by pulse wave velocity (PWV),. Our study showed a positive association between serum leptin and the aortic AIx in kidney transplant recipients even after multivariable linear regression analysis. The pulse pressure and aortic AIx, have been used for evaluation of the interactions between the left ventricular function and afterload imposed by the arterial tree. Wave reflections during mid to late systole, which are mainly influenced by the characteristics of the central vasculature, are important determinants of left ventricular afterload. Unlike PWV, direct measurement of aortic stiffness, the aortic AIx, is a relative measurement of wave reflections that contribute to aortic pulse pressure. In a study of 522 healthy Asian participants, the AIx value was associated with age, gender, and hyperlipidemia status, and gender differences in the AIx were caused by body height and vascular characteristics. In our study of kidney transplant recipients, the TG level was positively associated with the aortic AIx in simple linear regression analysis and body height was negatively associated with the aortic AIx in forward stepwise linear regression. A recent systematic review and meta-analysis showed the significant positive effects of statins in reducing the aortic AIx and improving arterial stiffness. In the present study, higher AIx values were noted in the statin treatment group in renal transplant recipients. Obesity is associated with leptin production and high plasma leptin concentrations. Abnormal production of adipokines participates in the pathogenesis of obesity-and insulin resistance-associated comorbidities, including vascular stiffness and hypertension. In addition, obesity is associated with vascular remodeling and stiffness and has been known to predict increased cardiovascular mortality. Excess adipose tissue, in particular abdominal adipose tissue, has been closely linked to the development of vascular stiffness and CVD. In this study, body fat mass was positively associated with the aortic AIx in univariable linear regression analysis. Reduced GFR was associated with higher aortic AIx values in subjects with mild chronic kidney disease (stage 2 to stage 4), a group known to be at highest risk of CVD, and in cardiac patients not followed by nephrologists. Moreover, the aortic AIx is related to the extent of coronary obstruction in chronic kidney disease patients. Our study revealed that the GFR was negatively associated with the aortic AIx in renal transplant recipients. Our study had some limitations. First, it had a cross-sectional design and therefore, the results need to be confirmed by long-term prospective studies before a causal connection between serum leptin levels and the aortic AIx in kidney transplant recipients can be established. Second, antihypertensive drugs such as β-blockers have been shown to increase the AIx, whereas other antihypertensive agents reduce the AIx. We did not record the antihypertensive medications used by the patients in our study. Third, the study enrolled a limited number of participants, and there was no case-matched control group, which could have resulted in selection bias. 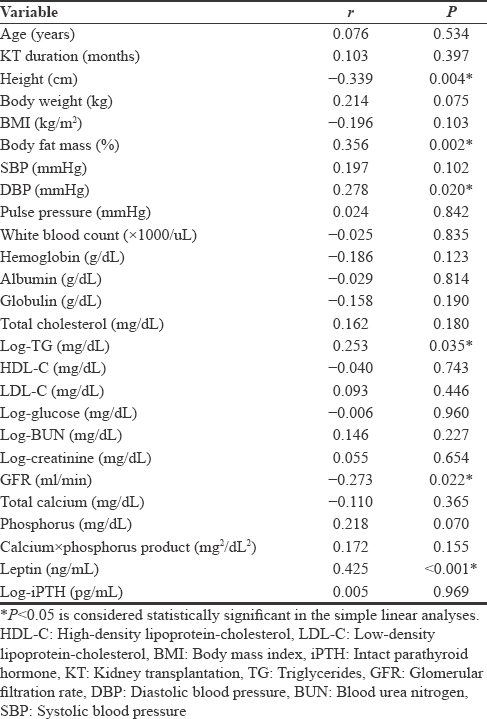 The present study demonstrated a positive association between AIx values and the serum leptin level and DBP, and a negative association between AIx values and body height among kidney transplants recipients. Furthermore, changes in of the serum leptin and aortic AIx values should be assessed to recognize the therapeutic effects of current medications in arterial stiffness. This study was supported by a grant from Buddhist Tzu Chi General Hospital, Hualien, Taiwan (TCRD101-06). Alan S, Ulgen MS, Ozturk O, Alan B, Ozdemir L, Toprak N,et al. Relation between coronary artery disease, risk factors and intima-media thickness of carotid artery, arterial distensibility, and stiffness index. Angiology 2003;54:261-7. Mahmud A, Feely J. Arterial stiffness is related to systemic inflammation in essential hypertension. Hypertension 2005;46:1118-22. Laurent S, Boutouyrie P, Lacolley P. Structural and genetic bases of arterial stiffness. Hypertension 2005;45:1050-5.
de Faria AP, Demacq C, Figueiredo VN, Moraes CH, Santos RC, Sabbatini AR,et al. Hypoadiponectinemia and aldosterone excess are associated with lack of blood pressure control in subjects with resistant hypertension. Hypertens Res 2013;36:1067-72. Sabbatini AR, Faria AP, Barbaro NR, Gordo WM, Modolo RG, Pinho C,et al. Deregulation of adipokines related to target organ damage on resistant hypertension. J Hum Hypertens 2014;28:388-92. Zhang Y, Proenca R, Maffei M, Barone M, Leopold L, Friedman JM,et al. Positional cloning of the mouse obese gene and its human homologue. Nature 1994;372:425-32. Beltowski J. Leptin and atherosclerosis. Atherosclerosis 2006;189:47-60. Vlachopoulos C, Xaplanteris P, Aboyans V, Brodmann M, Cífková R, Cosentino F,et al. The role of vascular biomarkers for primary and secondary prevention. A position paper from the European Society of Cardiology Working Group on peripheral circulation: Endorsed by the Association for Research into Arterial Structure and Physiology (ARTERY) society. Atherosclerosis 2015;241:507-32. Stoner L, Faulkner J, Lowe A, M Lambrick D, M Young J, Love R,et al. Should the augmentation index be normalized to heart rate? J Atheroscler Thromb 2014;21:11-6. Tomiyama H, Yamashina A. Non-invasive vascular function tests: Their pathophysiological background and clinical application. Circ J 2010;74:24-33. Meier-Kriesche HU, Schold JD, Srinivas TR, Reed A, Kaplan B. Kidney transplantation halts cardiovascular disease progression in patients with end-stage renal disease. Am J Transplant 2004;4:1662-8. Lee MC, Chen YC, Ho GJ, Shih MH, Chou KC, Hsu BG,et al. Serum leptin levels positively correlate with peripheral arterial stiffness in kidney transplantation patients. Transplant Proc 2014;46:353-8. Tsai JP, Lee MC, Chen YC, Ho GJ, Shih MH, Hsu BG,et al. Hyperleptinemia is a risk factor for the development of central arterial stiffness in kidney transplant patients. Transplant Proc 2015;47:1825-30. Tsai JP, Wang JH, Chen ML, Yang CF, Chen YC, Hsu BG,et al. Association of serum leptin levels with central arterial stiffness in coronary artery disease patients. BMC Cardiovasc Disord 2016;16:80. Chen MC, Hsu BG, Lee CJ, Wang JH. Hyperleptinaemia positively correlates with cardiometabolic syndrome in hypertensive patients. Int J Clin Exp Pathol 2016;9:12959-67. Hsu BG, Lee CJ, Chen YC, Ho GJ, Lin TY, Lee MC,et al. Serum osteoprotegerin levels associated with the aortic augmentation index in renal transplant recipients. Ci Ji Yi Xue Za Zhi 2016;28:20-3. Purdham DM, Zou MX, Rajapurohitam V, Karmazyn M. Rat heart is a site of leptin production and action. Am J Physiol Heart Circ Physiol 2004;287:H2877-84. Singhal A, Farooqi IS, Cole TJ, O'Rahilly S, Fewtrell M, Kattenhorn M,et al. Influence of leptin on arterial distensibility: A novel link between obesity and cardiovascular disease? Circulation 2002;106:1919-24. Yamagishi SI, Edelstein D, Du XL, Kaneda Y, Guzmán M, Brownlee M,et al. Leptin induces mitochondrial superoxide production and monocyte chemoattractant protein-1 expression in aortic endothelial cells by increasing fatty acid oxidation via protein kinase A. J Biol Chem 2001;276:25096-100. Westerhof N, Westerhof BE. A review of methods to determine the functional arterial parameters stiffness and resistance. J Hypertens 2013;31:1769-75. Chung JW, Lee YS, Kim JH, Seong MJ, Kim SY, Lee JB,et al. Reference values for the augmentation index and pulse pressure in apparently healthy korean subjects. Korean Circ J 2010;40:165-71. Sahebkar A, Pećin I, Tedeschi-Reiner E, Derosa G, Maffioli P, Reiner Ž,et al. Effects of statin therapy on augmentation index as a measure of arterial stiffness: A systematic review and meta-analysis. Int J Cardiol 2016;212:160-8. Considine RV, Sinha MK, Heiman ML, Kriauciunas A, Stephens TW, Nyce MR,et al. Serum immunoreactive-leptin concentrations in normal-weight and obese humans. N Engl J Med 1996;334:292-5. Lastra G, Manrique C. Perivascular adipose tissue, inflammation and insulin resistance: Link to vascular dysfunction and cardiovascular disease. Horm Mol Biol Clin Investig 2015;22:19-26. Martínez-Martínez E, Miana M, Jurado-López R, Bartolomé MV, Souza Neto FV, Salaices M,et al. The potential role of leptin in the vascular remodeling associated with obesity. Int J Obes (Lond) 2014;38:1565-72. Strasser B, Arvandi M, Pasha EP, Haley AP, Stanforth P, Tanaka H,et al. Abdominal obesity is associated with arterial stiffness in middle-aged adults. Nutr Metab Cardiovasc Dis 2015;25:495-502. Andrade J, Er L, Ignaszewski A, Levin A. Exploration of association of 1,25-OH2D3 with augmentation index, a composite measure of arterial stiffness. Clin J Am Soc Nephrol 2008;3:1800-6. Covic A, Haydar AA, Bhamra-Ariza P, Gusbeth-Tatomir P, Goldsmith DJ. Aortic pulse wave velocity and arterial wave reflections predict the extent and severity of coronary artery disease in chronic kidney disease patients. J Nephrol 2005;18:388-96.